Oliver, with a toy; can it be?! Why yes! Our prayers have been answered, and it’s all thanks to the Hol-ee Roller. As mentioned previously on All Things Dog Blog, Oliver is an extremely toy challenged dog. We have tried feverishly to find a toy he enjoys playing with, only to be sadly disappointed when we he turns his nose up at one after another. It seemed we had tried everything--small toys, big toys, soft toys, rough toys, noisy toys; nothing seemed to satisfy the needs of this companion pooch. OH MAN, There's a Treat Inside! The one thing we had noticed upon tirelessly trying to find a toy he enjoys, is that Oliver is an extremely food motivated dog; what dog isn’t right? However, please note the difference between food motivation and food aggression. Oliver is food motivated, in other words, he gets excited when food is presented before him, but will 'leave it' until given permission, and is not protective over his food. A dog that is food aggressive will become protective of their food when it is presented to them, and it can be very difficult to feed a food aggressive dog in the presence of another animal. This can include treat dispensing toys, so please be aware of this if you use such a toy with more than one dog present. Back to the subject at hand, Oliver, our food motivated, toy challenged dog. Loving food and getting extremely excited whenever presented, the obvious solution to our toy problem would be a toy that had food in it. And what do you know, that is exactly what we found. 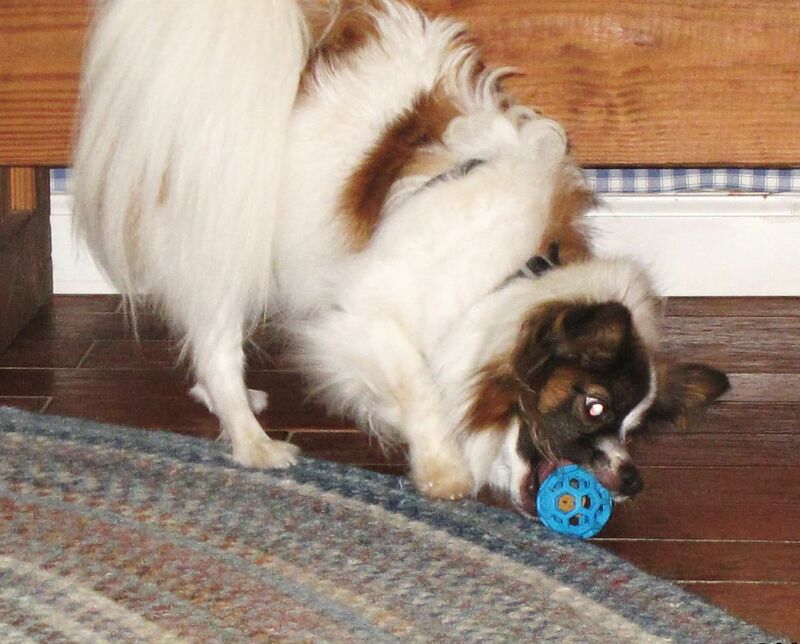 The Hol-ee Roller is a round rubber ball, with small hexagon shaped holes, that a treat can be placed inside for a dog to chase to their hearts content. The small holes make it difficult to get the treat out, which makes the fun last for hours! 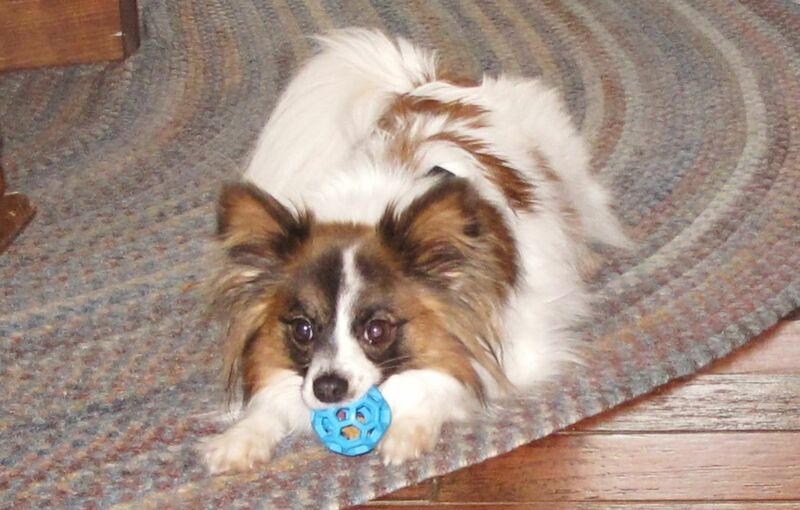 The Hol-ee Roller, made by J W Pet, is made of all natural rubber and is soft on the mouth, which is perfect for small dogs like Oliver who tend to have more sensitive mouths and are not keen on playing with toys. It is also certified non-toxic and guaranteed safe for your dog. We like that this toy has no plastic, phthalates or BPA. Oliver played and played with his toy until he lost it under one of our couches! Tanner even joined in on the excitement, watching curiously as Oliver played with the delicious smelling toy. I imagine he was quite jealous that Oliver had a new toy and he didn’t. However, Tanner has an entire basket full of toys, and of all sorts that he enjoys, and he retreated to take out the loudest toy and attempt to interrupt Oliver’s fun. But Oliver was too enraptured with trying to retrieve his treat; he did not mind Tanner’s disturbances one bit. All Things Dog Blog is sponsoring a giveaway of the Hol-ee Roller ball. You can find the post about this here, at our new feature, the Fido's Freebie Friday Blog Hop, where pet bloggers can list their pet-related giveaways and prizes to get the word out to more readers. Visitors may hop from site to site checking out our virtual shopping mall of free pet products. Feel free to join in every Friday, linking up your giveaway or sweepstakes posts directly to the linky, and including that linky in your own post if you'd like to offer more options to your readers. We look forward to seeing your soon. Sounds like a great toy! I also think it's great that Oliver can maintain control with food. Ohno and Joy LOVE theirs!! Thanks so much for the great doggie bag! Check out the pups reaction on my latest blog.